Adorable Child stayed at a friend’s house last night, so she doesn’t yet know what’s waiting for her here at home. Polimom and Dear Husband, otoh, have known about this since 4:30 am, when the doorbell rang. And when we didn’t rush downstairs, it rang yet again, accompanied by pounding. Evidently it frustrated them immensely that we didn’t race downstairs and outside. But you see, we already knew what was out there. Didn’t even have to peek out the window (though of course we did!). Because this was payback. Adorable Child and a flock (gaggle?) of her girlfriends had gone to someone else’s house earlier. And been caught. I told her that she really didn’t want to be caught. You may be wondering how it came to pass that I was even having such a conversation with her. Let’s just say that I can think of worse things they could be up to. Hilarious! (All caps and double-underlined.) Absolutely hilarious!! Does this mean that Adorable Child and her gaggle of friends have now hit the ultimate big time in popularity contests? What I find even more amusing is the fact that they got caught earlier doing the very same thing to someone else’s house! Not that I’m surprised they got caught. I can only imagine the noises they must have been making the whole time. In my experience, girls have never been able to keep silent while a ‘dirty deed’ is being conducted. It’s almost as if they want to be caught! PS. Who’s going to clean up this mess? For that matter, who cleaned up the other one?? Just hysterical, Polimom. I loved reading about it! Your first photo, btw, kind of makes me think of a wedding … the white, the procession, the rice being thrown … … well, that’s just my imagination working overtime here. What fun! I totally agree!! Girls (especially more than 2 or 3) cannot keep silent. Giggles, squeals and screams — it must have been REALLY funny to have watched them. Oh – and you simply must post pics of the clean-up festivities! It’s that crazy Katy lifestyle! Wild in the streets! So — the answer to “who’s gonna clean it up” is…. mostly her and one of her friends. (The other 3 were, conveniently enough, busy or unreachable)… and DH and me. We couldn’t get it all, but at least we managed to get it all out of the neighbors’. LOL! EdT — your response sounds very much like DH, right up until last night. He’s still not happy with the whole idea, but it’s a trendy junior high thing these days — and a VAST improvement over what I and my friends were doing. John T — you’re never gonna get away with much of anything when your folks are friends with the powers that be. Good story! This reminds me of my favorite TP-related story. My Father-in-Law went out one morning to get the paper to find a box on the front step with his name and address on it, with some toilet paper in it. 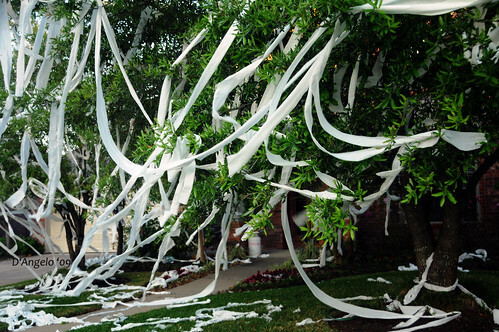 Seems by Brother-in-Law and his friends had TP’d a house, but had carried the TP to said house in a box with my Father-in-Law’s name and address on the box, and then left it at the scene of the crime. Master criminals, they. Needless to say they had to go clean the place up.